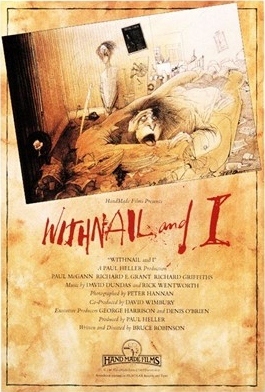 On paper, Withnail & I sounds like a film I would absolutely love. Two downtrodden actors, both of whom are drunk more than sober, take a road trip out to the country where they struggle to fit in with the country folk. This all takes place in 1969, the end of “the greatest decade in the history of mankind”, as one character states. Throw in some intelligent, well-crafted dialogue and a few spot-on performances, and it sounds like my kind of film. Yet Withnail & I is missing something, and I can’t quite place what it is. 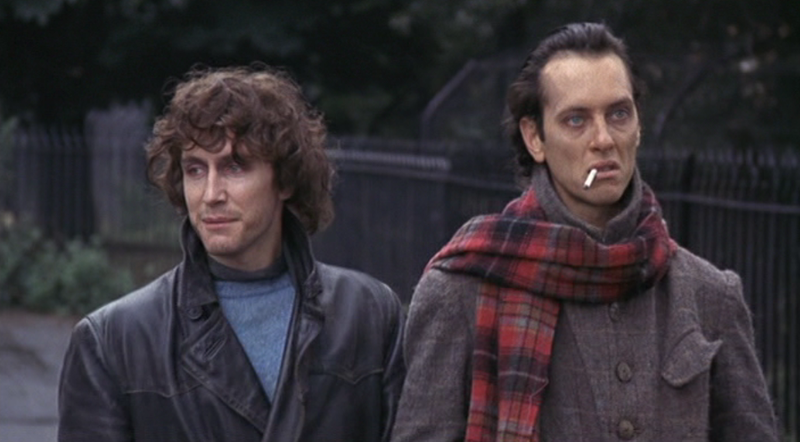 The main characters in the film, Withnail (Richard E. Grant) and “I” (Paul McGann), have basically hit rock bottom. Both are unemployed and struggling to get by, mostly due to their love of the bottle. Withnail, in particular, is especially hard up. At one point, out of desperation, he begins chugging lighter fluid. He seems to have a death wish, with little regard for his wellbeing. “I”, also known as Marwood (though it is never stated as such in the film), is basically just along for the ride. 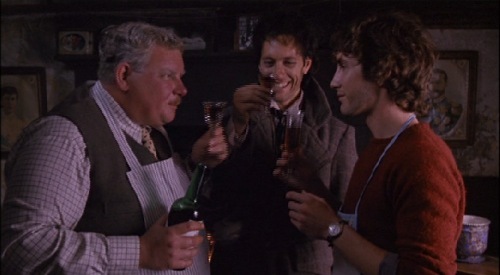 When the two of them decide they need a change of scenery, they hit up Withnail’s rich homosexual uncle, Monty (Richard Griffiths), who loans them his country cottage for a quick holiday. Their getaway is less than extravagant, as the cabin does not have proper heating, and they have little in the way of food and supplies. Monty comically (and unwantedly) shows up and hits on Marwood, making their miserable vacation even more uncomfortable. That’s pretty much the extent of the plot. In many ways, it feels like we are just witnessing a random week in the lives of two washed up blokes where nothing of any real substance happens. They drink, they talk, they complain of their situation, and then they drink some more. The two characters are clearly intelligent, as evidenced by their oft-witty dialogue, but they are difficult to connect with. While many of this cult film’s fans find their banter to be very quotable, nothing really stuck with me afterward. The performances are quite good, especially that of Richard E. Grant, but they are not enough to elevate what is a mostly dry film overall. Perhaps I just don’t get this sort of British humor, or maybe I wasn’t in the right frame of mind for the film. This is one that I truly wanted to love, but ultimately it just didn’t work for me. Good review, I have a lot of fondness for this film but I think it gets elevated to a higher status than perhaps it deserves! A lot of it seems improvised (as I think this is the way the director/writer likes to work) but I kind of love that thrown together chaotic feel and I love Grant’s performance..
Yeah, I was kind of surprised to find such a large cult following for this film. I liked some of what it set out to do, but overall it didn’t really click with me. I may have to give it another shot sometime down the road. I think dry is a fair way to describe this film. 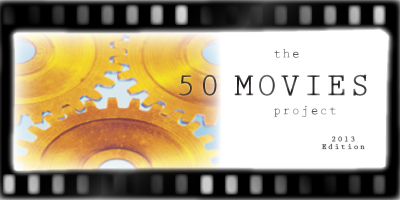 It’s such a purposefully ugly movie… I’ve seen it once, and once will always be enough. “Purposefully ugly” is spot on as well. It amazes me that this is a semi-autobiographical film — how can anyone live like that?? Two moments stand out for me — Withnail drinking the lighter fluid, and the scene involving the live chicken — but oddly enough, I can’t remember any quotes. Perhaps it will grow on me over time.